OK, it's been a while! Time for some reviews. I'm leaving out plenty, I'm sure.....since I haven't posted in a while. Crazy Heart - My favorite in a long, long time. Loved it so much, I insisted Blake saw it....this week......during my usual movie night. I know. I'm so giving. He enjoyed it, too. Upon returning home, I asked him if he noticed Coco (Maggie Gyllenhaal) was in the movie. "Yeah, it haunted me the whole time." Nice. I totally recommend this movie for music lovers. Jeff Bridges plays and sings all of it himself. Fantastic. 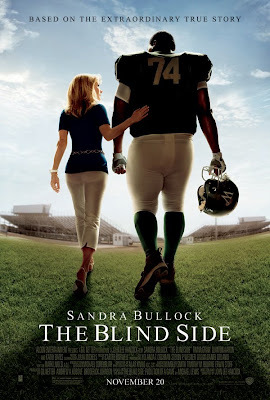 The Blind Side - Lots of hype for this one and I it lived up to it. A true story and it was beautifully played out on screen. Really enjoyed Sandra Bullock, too. Dear John - Very much a Nicholas Sparks story. I read many of his books after falling in love with The Notebook years ago. Not exactly my taste anymore. But, you'll love it if you love him. It's Complicated - Really enjoyed this one. I do believe I could watch Meryl Streep do just about anything......she's so wonderful.....and the men were great, too. Up in the Air - Very smart movie. George Clooney can do no wrong in my opinion. Valentine's Day - Half way through I thought I was going to agree with the reviews....and I still do in some respects.....but it was fun overall. Not ground breaking.....but a good date movie. (To which, I went alone, of course.) Be sure to stay until the end and watch the credits for a nod to Pretty Woman, a la Julia Roberts. Cute. When In Rome - Pass. She's precious. Weak movie. 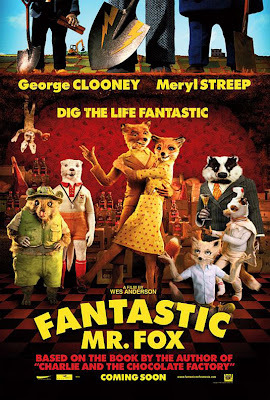 Fantastic Mr. Fox - Cannot say enough good about this movie. Totally weird. Not for everyone. If you have a kooky sense of humor like me, you'll absolutely adore it. Trailer.......if you don't get this......you won't get the movie. 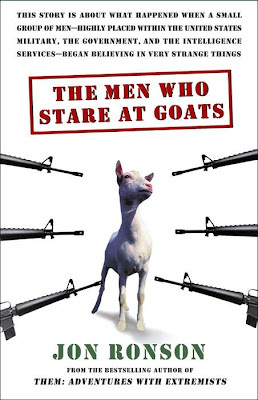 The Men Who Stare At Goats - Another movie not for everyone. Enjoyed it. Cannot wait for Shutter Island. Maybe tonight! What am I missing? Any must-sees? is that fox movie supposed to be like ocean's 11.
i am dying to go to the movies!!! The only one I've seen on your list is The Blind Side and I adored it. Thought Sandra Bullock nailed her character and I'm not usually a fan of hers. 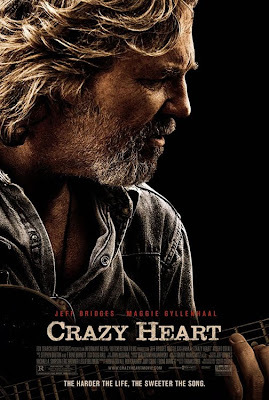 Cannot wait to see Crazy Heart. Trey wants to see it too. Most of these are on my list to see. I think I may have to start a movie night during the week. I just watched Law Abiding Citizen... I really liked it. I loved the Blind Side... so awesome. I haven't gotten around to the rest of these so I will watch the ones you gave a thumb ups to!! Loved, loved, loved Up in the Air. So different than what I thought. George Clooney is amazing. Want to see Crazy Heart and I don't care about the others. Except Shutter Island. Want to see that. And I'm glad I ruined Blake's movie. hahaha. Yea, yea, yea...Casey is SO giving. I will end up paying for taking away her precious movie night. I did take Casey's pop corn bucket and I felt ridiculous. That thing is huge! Have you ever seen the orange buckets at Home Depot? Yea, that big! Crazy Heart was great...Even though Coco was in it. Loved the music. It really is scary how much of a resemblance there is between the two (Coco & Maggie). I can see why so many people think that you are her. i used to date a guy who looked like a young jeff bridges, so he kind of freaks me out. lol, but i will have to try it out! want to see anything with clooney. i am with you on that one. don't want to see the goats. :) thanks for the reviews! let us know about shitter!! I heart Shutter Island wasn't all that good? So many movies to see. So little time. Goats has Clooney in it. Now do you? oh he IS? hmmmm, i could perhaps re-think that then. clooney is muy fabuloso. Geez, you have seen lots of movies! The only one I saw on your list was Valentine's Day (I saw it by myself too). It was cute, but nothing to rave about. I really want to see the Blind Side and now Crazy Heart. Tony and I have watched SO many movies. It's really ridiculous. Just like weekend we watched 7. SEVEN. We get bored when the girls aren't here. I really liked Up in the Air. I can watch Clooney and Meryle do anything. I also cried with laughter at It's Complicated. I haven't seen the others. Coco, it seems like it is time for a date night or afternoon. WOW! You've been busy! I can honestly say I've only seen ONE of these movies! I have some work to do! Really appreciate your reviews, now I won't waste my time on some of them! I go to the movies once a year...this year I might have to see Shutter Island. I love scary movies and Leonardo Decaprio. Up in the Air was my favorite of those on your list but I cannot cannot cannot cannot cannot wait for Alice in Wonderland. Two of my favorites- Johnny Depp + Tim Burton = my heart. Movie theater? What's that? LOL!!! I can't wait to see quite of few of the movies you have listed. Thanks for the insight. Happy Friday! My husband really wants to see "Crazy Hearts." I'm iffy. Loved "Blind Side," after resisting that one, too! I so enjoyed it. 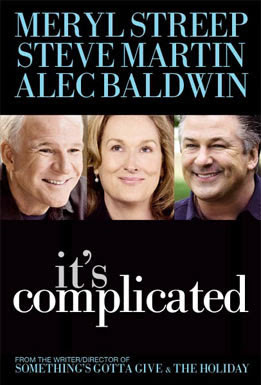 "It's Complicated" -- I dragged my whole family to see that after Christmas and I have to admit I didn't like it nearly as well as I thought I would. 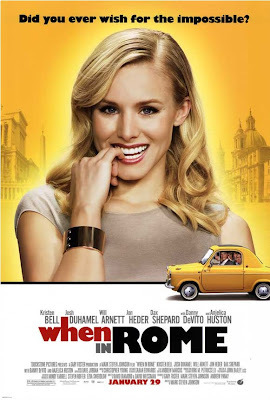 I thought it was funny up to the point where there was the realization it's a movie about cheating -- and when there's cheating in a marriage, someone gets hurt. So that was kind of sobering. 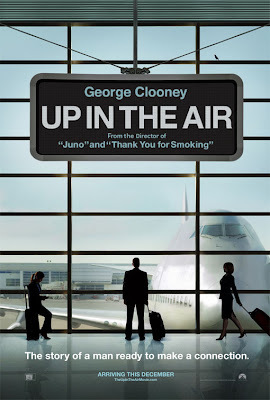 I enjoyed "Up in the Air," but don't think it was the be-all-end-all everyone else seems to think. Hmm -- that's a lot of movies in 2 months! Here's a heartwarming film that's on DVD and not in theaters, "Mr. Jimmy's Birthday Challenge." It's a documentary about Mr. Jimmy, of Crystal Springs, Miss. and how the townspeople of this small town surround and embrace him in his quest to walk, run and bike 80 kilometers for his 80th birthday. Life lessons here, on preparing for death by learning to how to enjoy life right up to the end, as he puts it, and that you're never too old for new adventures. IMDB has the trailer.